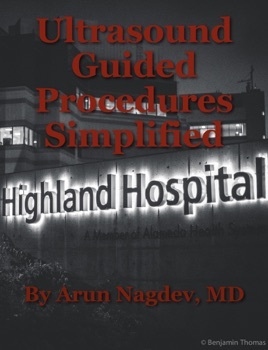 This simplified pictorial guide to ultrasound-guided procedures comes from years of learning how to safely practice medicine at a county residency training center in Oakland, California. The goal is to make the individual “chapters” short and simple, so that residents and faculty are successful in the procedure. The chapters are not exhaustive, and meant to be used when working in the clinical department. When you have time, a simple web search will lead you to excellent resources to complete your knowledge of the procedure. Exactly what you want to see while performing a procedure at the bedside. High yield as it gets!